Just popping in to share an easy weeknight dinner (or perfect side dish for a party) recipe that I made last week! This is 110% husband approved. I need to put that out there first. Normally, you won't find me eating pasta, just because I'm not that big of a fan (please don't kill me), but that also means you won't find me cooking it in our house. Insert husband tears. I told Billy when I got back from Texas that I would eat pasta on a weeknight, so here I am, living up to my pasta promise. Men are so funny with food, aren't they? Don't even get me started on the fact that he went to our local bulk grocery store last week (sans list from myself) and bought HALF of the store. And I bet you can take a pretty good guess at where half the items came from...I can tell you right now it was NOT the produce section. It's filling, easy to throw together, and light/refreshing for summertime! -recipe adapted from two peas and their pod: I left out the olives and also added a little bit of light italian dressing. 1. Bring a large pot of salted water to a boil. Cook the tortellini according to the package directions. Drain the tortellini and rinse with cold water. 2. Place the tortellini in a large bowl. Add the tomatoes, cucumber, olives, red onion, and feta cheese. 3. In a small bowl, whisk together the olive oil, vinegar, garlic, oregano, salt, and pepper. Pour the dressing over the salad and stir until salad is well coated. Serve immediately or place in the refrigerator. Hello leftovers! Hello lunch the next day! So many options here. Are you a fan of Greek Salads? Don't forget to enter this giveaway and this giveaway I have going on while you still can! My daughter is moving into a house at MSU for her first time living out of the dorm and this would be great for her to make and keep in the fridge. She loves feta! Yum! I'm totally going to try this! It looks so good! I will definitely be trying this next week! My husband and 10 month old are going to love it! I LOVE tortellini! It's usually my go-to pasta dish at any restaurant. 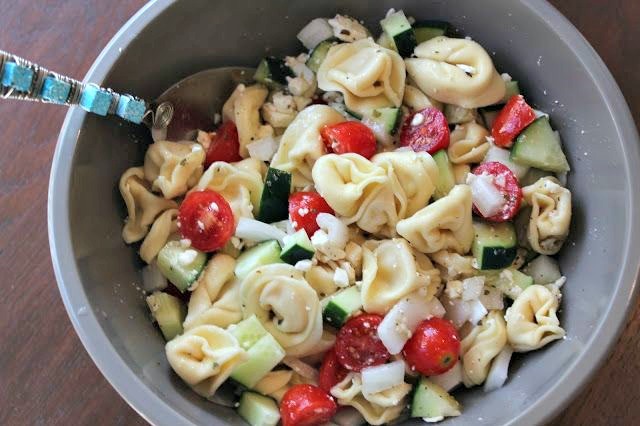 Have you ever found whole wheat or whole grain tortellini? I would feel less guilty eating it that way! Normally I don't like pasta salad (don't shoot me!) but I always make an exception for anything with cucumbers and feta. I'm going to have to make this ASAP! This looks SO good! I love anything with feta in it. :) I pinned it so I'd know where to go to find it. ;) Thanks for sharing! Looks sooo good! Pinned so I can make it this summer :) Thanks for sharing! I love greek flavors and I LOVE feta! I will definitely have to put this on the "to try" list! i'm going to have to try this! looks so good. Ooh this looks yummy. Thanks for sharing. YUM! This looks delicious...my mother in law makes a salad with baby tomatoes, cucumbers, feta, and balsamic but I need to try this variation with the tortellini! I seriously think I pin every recipe you post! This sounds great! well doesn't that make my day?! thank you so much! so nice to hear. thank you :) hope you like it! 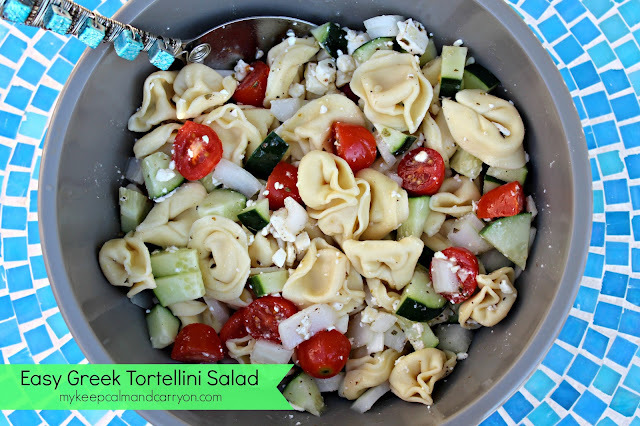 I love Greek and tortellini. This looks tasty. As an aside, I looked quickly and thought you write "My 110% husband approved". And I started wondering what a 110% husband was. Haha. Oh this looks really good, I love tortellini. I wonder what I could use in place of feta.. not a huge fan of that. we're basically twins. I made this exact thing earlier in the week but with farfalle instead of tortellini! I wish I had left out the olives because bleeeeegh, gross. OMG now im starving and this looks amaze balls! You know what's funny, my boyfriend and I are the exact opposite. He keeps me from eating all the pasta and bread.